Thomas Jefferson Anderson Jr., was born November 21, 1919, in St. Joseph, Missouri, to Thomas Jefferson Anderson Sr. and Hazel G. Shultz Anderson. 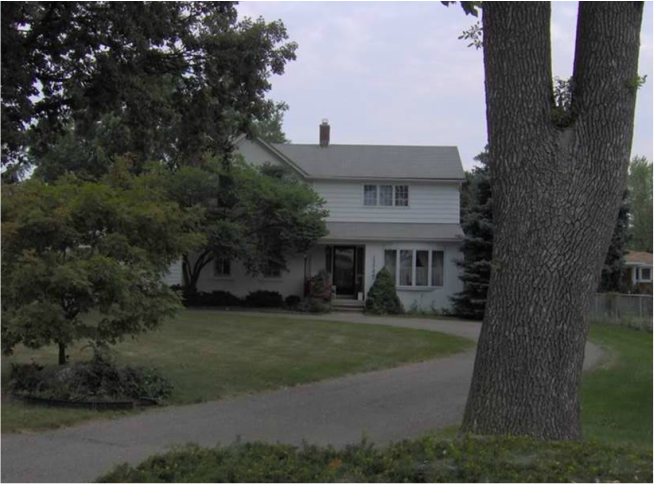 The family moved to Michigan when Thomas was a young man. On June 27, 1942, Thomas Jefferson Anderson Jr. married Margaret, daughter of John and Christine Van Costendorp in Detroit. He served in the United States army during World War II and during the Korean War. He received an engineering education, and worked as a supervisor of publications and automotive assembly problem control at the Ford Motor Company. A man of varied interests and talents, Thomas Anderson was a director of the Southgate Bank and after five years as Ecorse Township Supervisor, he became Southgate’s first Mayor, serving from 1958-1961. He served as a member of the Michigan State House of Representatives, 28th District from 1965 to 1982 and was a delegate to the Democratic National Convention from Michigan in 1984. He was a member of the Kiwanis Club and the American Legion. After he served as Southgate’s first mayor from 1958-1961, Thomas Jefferson Anderson continued his political career with his election to the Michigan State House of Representatives from the 28th District. During his 18 year stint-he served from 1965-1983- in the Michigan State House of Representatives, he chaired the House Conservation Committee for 14 of those years. Later, he was a member of the Michigan Natural Resources Commission and during his tenure was one of its members voting unanimously for catch and release of fish on the Au Sable River. During his years in the Michigan legislature, Representative Thomas Jefferson Anderson, Democrat and descendant of Thomas Jefferson, built a solid environmental legacy for future generations. In the late 1960s and early 1970s, Thomas Jefferson Anderson played a key role in developing and passing environmental legislation that established the state of Michigan as an international leader in protecting the environment. This legislation protecting the environment included the Michigan Environmental Protection Act of 1970, which he and Professor Joseph Sax of the University of Michigan jointly authored, setting the standard that a healthy environment is the legal right of every citizen. This Act empowers a citizen, village, township, or city to suit any person, corporation, or governmental unit to protect air, water, and other natural resources. 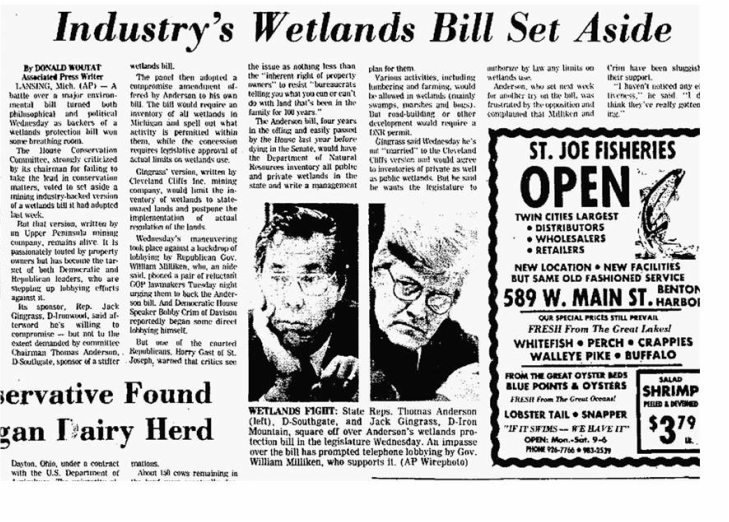 The Michigan environmental Protection Act of 1970 provided a model for legislation across America, including the National Environmental Policy Act. Although he was a Democrat, Thomas Jefferson Anderson considered conservation nonpartisan and he worked alongside Republican governors like William Milliken to protect and enhance natural resources Representative Anderson helped create and guide into law the Inland Lakes and Streams Act, the Natural Rivers Act, the Wetlands Protection Act, and the Recreational Land Trust Fund Act. He also was instrumental in passing the Michigan dunes protection, endangered species, and wilderness protection acts. Thomas Jefferson Anderson championed conservation policies as well as environmental legislation. From the mid-1960s to mid-1970s, he worked alongside former Department of Natural Resources Directors Ralph MacMullan and Gene Gazlay to regulate and reform Michigan’s conservation ethics governing the laws, policy, public awareness and support of conservation laws. He counted Natural Resource Commissioners Matt Laitala, Carl Johnson, Harry Whitely, and Gus Scholle as colleagues and allies in his conservation efforts. A committed sportsman, Thomas Anderson and his friends Howard Tanner and Wayne Tody worked to establish new and improve existing Great Lakes fisheries and led in the campaign to raise standards for bear management and hunting. He helped lay the foundation for the Michigan Conservation Foundation and the Michigan Wildlife Habitat Foundation. In 1984, he became a trustee for the Michigan Wildlife Habitat Foundation and served on its Executive Committee. In 1970 and again in 1980 the Michigan United Conservation Clubs honored Thomas Jefferson Anderson, naming him Legislative Conservationist of the Year in 1970, and Michigan Conservationist of the year in 1980. The U.S. Environmental Protection Agency awarded him its Environmental Quality Award. Lansing, Mich. (AP) A Southgate legislator wants to make it easier for companies to obey Michigan environmental laws by streamlining the bureaucracy that administers those laws. State Rep. Thomas J. Anderson said he will ask for House approval of a news legislative committee to review the way the state protects its natural resources. Anderson, chairman of the House Committee on Conservation, Environmentalism, and Recreation said his move should not be seen as an indictment of the Department of Natural Resources or of the state’s environmental laws. Lansing (AP) Democratic and Republican tax neotiators planned a meeting today, after two wearing days and nights of debate proved the futility of trying to reach bipartisan fiscal agreement on the floor of the House. Democrats said the Republican tax package hooking an income tax with a $600 exemption and no sales tax cut to raise money for among other things, property tax relief – amounted to taxing the poor to cut taxes of the wealthier. Republicans contended their plan would provide more money to hard pressed local governments. The House is evenly divided between the two parties 54-54, thus neither can pass or amend a bill without at least one vote from the other. Some amendments to the bill were adopted. Two changes deleted provisions exempting from the proposed income taxes financial institutions and insurance companies not based in Michigan, but doing business in the state. Some members said they didn’t know why the insurance firm section was in the bill in the first place and added that when they tried to find out what would be the effect of removing it, they were told the information wasn’t available anywhere. Lansing (AP) Rep. Thomas Anderson, D-Southgate, today said a recently enacted law would cut down on motorists who pass school buses that have stopped to pick up or discharge children. The new law permits school bus drivers to take down the license number of the offending car and the owner will be cited for the violation. An owner can avoid prosecution by showing that he was not the driver at the time of the incident, Anderson said.